2. Discard the stems of fenugreek leaves. 3. Wash leaves well, drain and chop coarsely. 4. Place in a strainer over a bowl. 5. Pour 2 cups of boiling water over leaves and set aside to drain. 6. Heat 1 cup oil in a frying pan over moderate heat. 7. 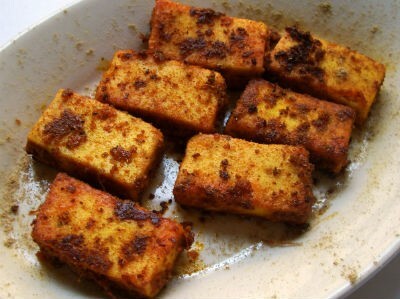 Lightly fry paneer in batches. 8. Drain well and set aside. 9. Heat 1 tblsp of the same oil in a heavy based pan over moderate heat. 10. Sprinkle in cumin seeds and when they splutter, mix in onion, coriander leaves and chillies. 11. Add fenugreek leaves and mix well. 12. Drain rice and add to pan. 14. Mix in salt and 2 cups of water. 15. Cook rice for 10 to 15 minutes till water is absorbed and rice is tender. 16. Lightly stir in paneer. Feel free to comment or share your thoughts on this Paneer Methi Chaval Recipe from Awesome Cuisine.